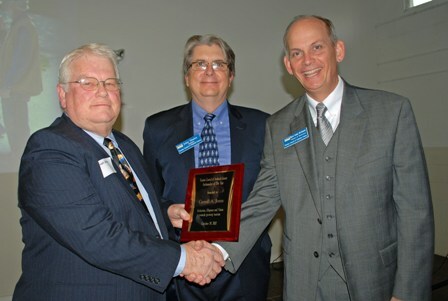 Photo Caption: Frederick Mayor Randy McClement, right, and Tourism Council of Frederick County Board President, center, present Carroll Jones, left, with the 2012 Ambassador of the Year award. Frederick, MD - On Friday, October 19, 2012 the Tourism Council of Frederick County (TCFC) honored Carroll Jones as the Tourism Ambassador of the Year during its Annual Membership Breakfast. The Tourism Ambassador of the Year award can be presented to anyone in the community, whether in the tourism industry or not, who helps to improve the experience of visitors to Frederick County, thus helping the TCFC to achieve its mission. Jones, former Mayor of Brunswick, served on the TCFC board for the past nine years as an appointed member and liaison representing the Council of Governments. “He took his role on the tourism board very seriously, and his support has undoubtedly advanced tourism development efforts in Frederick County,” said John Healey, TCFC Board President and Executive Theater Manager for the Weinberg Center for the Arts. Jones was nominated jointly by new Brunswick Mayor Karin Tome and Brunswick City Administrator Rick Weldon, as well as by Christina May, Chair of Brunswick’s Economic Development Commission. Frederick Mayor Randy McClement presented Jones with the award. In addition to serving on the TCFC board, Jones’ approached economic development in Brunswick with an eye towards tourism while mayor. Jones understood “the value of Brunswick’s many recreational and historic assets to residents and visitors alike,” stated May in her nomination statement for Jones. During his tenure as mayor, Jones was an advocate of programs like Canal Towns Partnership, partnerships with the C&O Canal, cooperating with private businesses, and embracing the city’s railroad history and the Brunswick Railroad Museum. Most recently, Jones was instrumental in opening the Brunswick Visitor’s Center. Additionally, “Carroll can often be seen greeting visitors and giving out directions as needed, no matter where he is in town,” stated May. This award bestows “a fitting honor on a good man who gave his best for many years,” said Mayor Tome and Rick Weldon in their nomination statement. At the event, held at Alexander’s in Buckeystown, Maryland, a number of other staff and board members were recognized for their service and ongoing efforts to support tourism in Frederick County.